It is our great honour to host you here in thi unique environment which Ston can offer,this Medieval little town with whose history reaches back as far as the 14th century.It is a small town with the longest stone wall in Europe(5,5km),with narrow quiet streets,noble ancient houses and with traces of ancient cultures. Its former value as a „salt city“ gets confirmed even today in the plants of the oldest active salt-works in the world.These saltworks have remained faithfull to the tradition and to the natural way of salt production which has not changed since remote ages. The gulf of Mali Ston with places Mali Ston,Hodilje,Luka,Duba has a clean and natural environment.It has been well-known for its mussel and oysters-growing farm since Roman times,and the oysters from Ston(ostrea edulis),as an acknowledged natural aphrodisiac has made this region world-famous. Bay Prapratno with its centuries old olives tress,Mediterrean macchia thickets and clean sandy beaches and the site of one of the lovelist camps in this region. 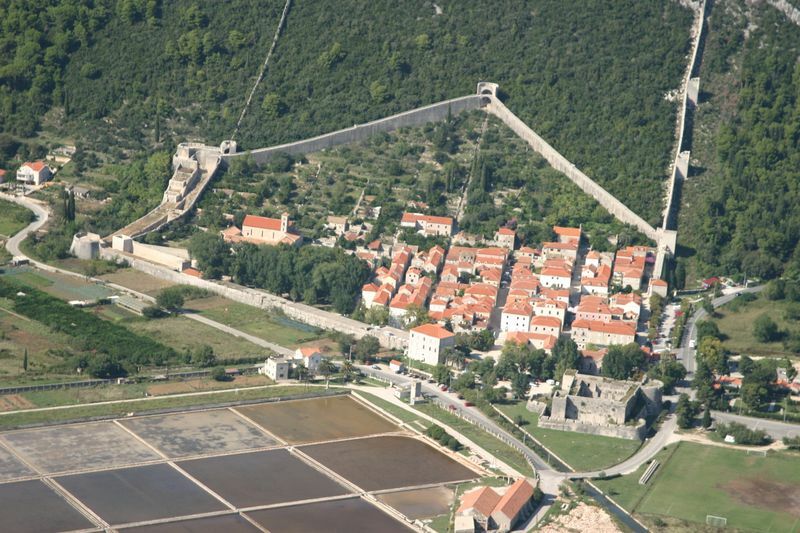 In Ston channel protected from the wind settled, two small towns Kobaš and Broce known for nautical tourism.